Are you a school that manages sporting equipment for your student sports programs? A municipal Parks and Recreation department that has both facilities and equipment to manage. A golf course, tennis club or country club? Then you know the challenges associated with managing your equipment with care. Sporting equipment is expensive and seasonal, but when you need it, you need it quickly and you need it to be serviceable. Mobile High Density could be your solution to a very challenging segment in space management. The space in and around sporting facilities is typically costly and heavily trafficked. You need a management solution that treats your valuable sports equipment inventories accessible, safe and the best condition possible. Moveable shelving units can be adapted to multiple sporting requirements at once and your equipment can be maintained and easily accessible by planning and design. Are your staff members wasting valuable time combing through stationary shelving units, small rooms or worse yet any closet they can find to hold their inventory? 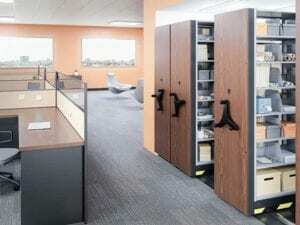 JB Office Matters has attractive and modular solutions to even the most challenging requirements. Call us or contact us today to put us on your team for a better and easier to use management system for your valued sporting equipment.